Made these two yesterday..commission piece. Love this clasp very much! I really like your clasps, very nice work! 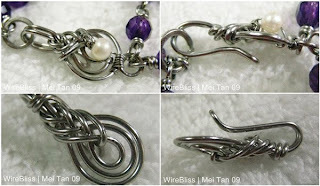 What a nice clasp Mei...I like the look of these kinds of clasps but I've never used them before...do they work well? I've wondered if they unhook themselves. Most of my customers don't want a toggle as they are afraid it will come undone so I often use boring lobster claws!